Myers and Sons Construction has the unique ability to construct various types of new bridges including cast-in-place, post-tensioned concrete box girders; pre-cast, pre-tensioned concrete girders and slabs; and structural steel girders and trusses carrying vehicular, pedestrian, equestrian, and recreational traffic. In addition, Myers and Sons Construction constructs retaining walls, box culverts and other large concrete structures. "I have worked with Myers and Sons Construction for a number of years. These contracts have all been successful. They have been marked by a high degree of cooperation and partnership. Myers has shown an aptitude to deliver a high quality project as a team that will consistently be ahead of schedule and under budget. 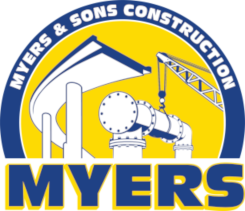 As a Construction Manager, I am delighted when Myers and Sons is awarded a contract with us, since history has shown we will be getting a claim free, high quality product delivered early and under budget."